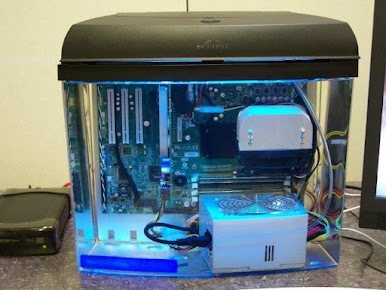 When you’re spending thousands upon thousands of dollars on a firebreathing, water-cooled, no-holds-barred glory of a PC, you don’t want to skimp on the enclosure. At CES 2017, Phantek launched the Enthoo Elite, a luxurious $900 case built for luxurious PCs. And when I say “PCs” I mean that literally—there’s room for more than one. This massive (yet gorgeous) sandblasted aluminum tower is so customizable that you can fit not one, but two PCs inside if you’d like—one up to E-ATX, the other mini-ITX. But the Enthoo Elite isn’t just for dualies. The inside of this 30-inch tall, two-foot wide behemoth was built to allow all sorts of exotic high-end liquid-cooling builds, with room for up to five radiators as well as prefitted reservoir mounts. I witnessed just such a rig in action at Phanteks’ CES suite and it was breathtaking. A case that’s $900 needs to do more than that to prove its worth, and the Enthoo Elite’s packed with thoughtful little touches intended to make the lives of PC enthusiasts easier. The power supply’s tucked away behind the motherboard tray, for example, and the back panel of the case was designed with a curved bottom that helps it easily slip back into place with no need to fuddle around and line up clips with slots. An adjustable bracket in the front slides around so you can hide your reservoir cables and SSDs, sticking to the Enthoo Elite’s superb cable management. The large tempered-glass side panel swings out on a hinge instead of relying on thumbscrews. The RGB controls are on the right side of the panel. Heck, the beast even has RGB controls built into its front panel, while the light strips inside automatically integrate with the RGB software used in MSI and Asus motherboards. And yes, that front panel also includes HDMI and USB ports (including Type-C) for virtual-reality users. The Phanteks Enthoo Elite’s vertical GPU mount accessory. Phanteks isn’t skimping on modular accessories either, extending the case’s versatility even further (as you’d hope from a $900 case). The Enthoo Elite comes with a wide variety of brackets, mounts, and other plug-in goodies, including a vertical GPU mount that lets you show off your graphics card’s waterblock and a solid panel that can replace the air filter at the top of the case if you’d prefer your rig to be a bit quieter. And check out this insane box the Enthoo Elite ships in. It looks like something you’d find Harry Houdini shoved into. One of Phanteks’ new GTX 1070 and GTX 1080 waterblocks. The Enthoo Elite will go up for preorder in the U.S. imminently and is expected to ship sometime in January or February. Phanteks is also releasing a wide variety of graphics card waterblocks and tubing brackets designed with the same look and feel as its cases. Because if you’re spending thousands of dollars on a price-is-no-object enthusiast rig, you’re going to want the extras to match your $900 case.